A polished metal key chain with a leather like front and polished metal back. Imprint is either printing on the front leather side or laser engraved logo on the reverse. SKU:A7307. 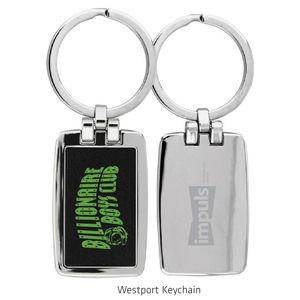 Categories: Keychains & Bottle Openers, Promotional Merchandise. PRICE INCLUDES ONE COLOUR, ONE LOCATION IMPRINT. Initial set-up charge applies. Additional colours/locations are $0.20(G)/unit/colour/location, plus a $60(G) setup charge/colour/location. Production time begins after all approvals.